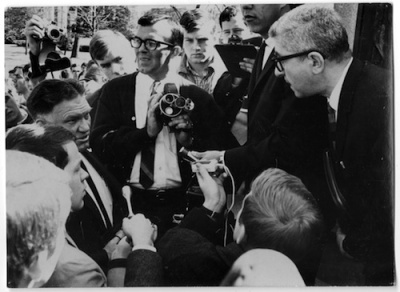 On March 9, 1966, Herbert Aptheker attempted to speak to students near the Confederate monument at UNC-Chapel Hill. The campus police chief escorted him a short distance away to a spot technically off-campus. There, Aptheker, a historian and member of the Communist Party, spoke to 2,000 students from the sidewalk outside the rock wall that separates the campus from Franklin Street. The speech came almost three years after the state legislature passed on June 26, 1963, “An Act to Regulate Visiting Speakers at State Supported Colleges and Universities,” otherwise known as the Speaker Ban law. The action came just weeks after students joined others in Raleigh to advocate civil rights. The Speaker Ban forbade from speaking at a state school any known Communist, anyone who advocated overthrow of the government, or anyone who exercised Fifth Amendment rights when questioned on related topics. Passage of the law came with very little debate on the last day of the legislative term. Administrators, faculty and students loudly protested the infringement of First Amendment rights but it was not until 1968 that the law was declared unconstitutional. In October 2011 a marker commemorating the actions of students to challenge the Speaker Ban law was dedicated on the spot where Aptheker’s speech took place. For more, check out “William Friday and the North Carolina Speaker Ban Crisis, 1963-1968,” in the North Carolina Historical Review from N.C. Historical Publications.